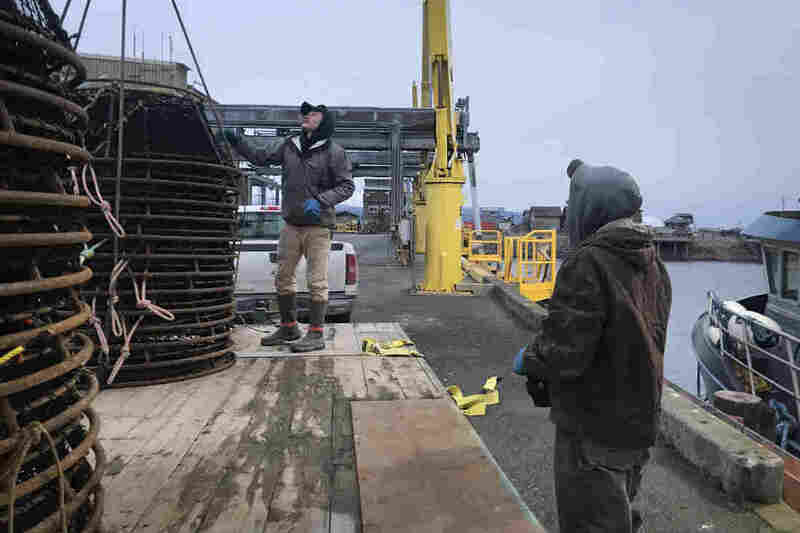 Alaska Fishermen Hauling A Bigger Catch With Gear They Get To Use For The First Time Alaska fishermen who took advantage of new regulations allowing them to fish with a previously banned piece of gear are happy they saved their catch from hungry whales. Peter Neaton and his crew unload black cod pots in Homer, Alaska after a November fishing trip in the Gulf of Alaska. Longtime Alaska fisherman Bill Harrington has a few choice words about killer whales. "As far as I'm concerned, they're only thieves in tuxedos," Harrington says. He's retired now, but a video from a decade ago shows him pulling in his line as he curses out a pod of killer whales swarming his boat. His catch is exposed; he is not happy. A sperm whale bursts out of the water and Harrington tells them what he really thinks. He knows even just a couple of killer whales could pick his line clean. The video was taken a decade ago and Harrington says the problem of whales stealing fish off longlines has only gotten worse. Harrington and his crew would travel a hundred miles or more and bait thousands of hooks attached to a commercial fishing line by hand. They would then anchor the line to the ocean floor between two buoys. But now fishermen are taking advantage of new regulations that let them fish with a previously banned piece of gear. In the coming years, longline fishermen in western Alaska will be allowed to catch halibut in longline pots, also known as traps in other parts of the country. Instead of fish being exposed on hooks along the ocean floor, fish swim into enclosed containers seeking the bait inside, where they're protected from hungry whales. North Pacific regulators prohibited pots in the 1980s and 1990s; they can get tangled with traditional longline gear, and they're large and heavy. Now that regulators have re-approved pots, some fishermen are investing in them. "If everybody could go to pots, it would be a great thing for the fishery," says fisherman Roy Wilson. He delivered his last halibut load to the docks in Homer as the season closed earlier this fall. He ended his last trip early because of killer whales. "We just left a lot of fish on the ground," Wilson said as he stood in the wheelhouse of his boat. "Probably $50,000 worth of fish on the grounds that we won't ever see again, but at least the fish are alive." Despite smaller paychecks for both him and his crew, Wilson is happy he prevented even more fish from going to the whales—although whales ate more halibut than he pulled in on the trip. The National Marine Fisheries Service estimates that whales eat about $3.1 million worth of Alaska black cod per season. Other regulators are still estimating those numbers for halibut, but fishermen say they're losing thousands of dollars per trip. Wilson also fishes for black cod in the Gulf of Alaska, where black cod pots have been legal since 2017. He's made the switch for those trips—but there are reasons other fishermen are reluctant to. "The gear is just so expensive," Homer longliner Erik Velsko said as he stood on the deck of his boat in the harbor. Velsko is thinking about spending $200,000 just to get started. He also views the switch as a conservation measure. He fears that black cod managers are underestimating just how many fish whales are eating. "I think if we just keep doing what we're doing, it's just going to get worse and worse and harder and harder every year," he added. He may stop black cod fishing altogether if he can't afford the switch to pots. On the deck of Wilson's boat, his 28-year-old daughter Marissa Wilson is cleaning fish. She worked for her dad full-time up until last year when she took a desk job in conservation. "This is the first year that I haven't gone out fishing, and I've had to do a lot of soul-searching," Wilson explains as she cuts up more fish. She's been thinking about buying her own boat, but deciding what species she might fish for is a big financial decision. "I don't think I'll ever stop feeling like a fisherman. I'm taking a little hiatus, but I've always got my eyes on the ocean," she said. She's thinking about fishing for black cod. If she invests in pots, she won't have to worry about those thieves in tuxedos.